Bob is seen in a flashback when he’s alone, fending off walkers in a makeshift shelter and swigging from a bottle of Nyquil. While walking down the road, Glenn and Daryl (on his beloved but long-gone motorcycle) find him. Daryl asks Bob the Three Questions and Bob’s answers seem to have passed the test, so he’s invited to join the group. Back to the present and he, Maggie and Sasha are in the woods, in the fog – fog and zombies, the stuff of which horror flicks are made – fighting walkers. Sasha saves both Maggie and Bob with her gun, bit manages to hit Bob in the process. She only winged him and they’re able to start back down the road. They come across the sign for Terminus and Bob tells them about the radio broadcast regarding a sanctuary which he and Daryl heard in the car. I’m really glad they finally mentioned that radio thing because I was wondering if we were ever going to hear about it again. Sasha says that it sounds too good to be true but Maggie wants to find it and they head towards Terminus. When they find a spot to sleep, Sasha thinks it would be better to just find some building where they can be safe, She tells them that the walker attack in the fog is a warning, the odds are Atlanta is dead, everybody may be dead, and they may be soon. When morning comes, Maggie is gone, leaving a note in the dirt for them – “Don’t risk your lives 4 me. Good Luck.” Sasha doesn’t want to after her, but Bob is going so she follows him. Setting up camp later on, Bob and Sasha talk about the noises of the night – walkers, owls, gators, everything that makes them a little jumpy. Bob can;t sleep and Sahsa asks him what they’re doing out here. Bob wants to know if she thinks Tyreese is dead. He asks her if the real reason she doesn’t want to go to Terminus is that she might find out he is and that she’s afraid of that. Maggie has been making her way along the tracks and sees another Terminus sign. She starts to leave a note, but a walker comes along. Maggie finishes it off and then eviscerates it, using it’s blood to leave her message – “Glenn, go to Terminus. Maggie.” A while later Bob and Sasha find the note and continue along the railway. They come across a building that Sasha thinks would make the perfect spot to set up shelter and turn into a safe place. Bob doesn’t want to stop. He wants to find Maggie, so he kisses Sasha,hoping that she’ll change her mind. She tells him that he doesn’t have to be alone again and he says he won’t be, then walks away. Sasha goes into the building and starts to cry. When she pulls herself together, she starts to look around and happen to look out of a window. She spots Maggie, lying amid a group of walkers and leans on the window. It falls to the ground, rousing the walkers and Sasha runs out to help Maggie. They fight them off, barely, and Maggie asks about Bob. Sasha tells her that Bob is looking for her. Maggie tells Sasha that she heard what she and Bob said their last night together, that Glenn is probably dead but she believes they’re wrong. She tells Sasha that she was waiting near the binding for them because she needs their help. “I can ask you to risk your lives because you’ll be doing it for a good reason, to find Glenn. ” Sasha says that she’s afraid so Maggie tells her that they should get out of there and go find Bob. They catch up with him on the tracks. Then we see Glenn, who’s found the Terminus sign and one of Maggie’s notes. Beth is learning to use Daryl’s crossbow and she thinks she’s so good with it that she may not need him any more. When a walker approaches and she misses her target, Daryl saves her. Maybe she should spend a little more time learning how to use that thing before she decides to fly solo. In the middle of it all, Beth has sprained her ankle, which Daryl wraps for her. They come across a cemetery and Daryl gives a Beth a piggyback ride before they stop so that Beth can look at a headstone. While she reads the name and the dates, which went back to the Civil War, Daryl places a bunch of flowers on the stone. Holding hands, the two walk to a the door of a funeral home. The inside is clean, absolutley spotless, as if someone has been caring for it. They poke around and find a body laid out in a casket with more bodies in the embalming room. Beth thinks it’s all beautiful, that someone cares enough to treat them like the people they once were and give them a proper funeral. Daryl, hmm, not so much. When they look in the kitchen, they find that it’s stocked with food and drinks. None of the items have even a speck of dust on them and Daryl is happy to find peanut butter and pig’s feet – “a white trash brunch”. 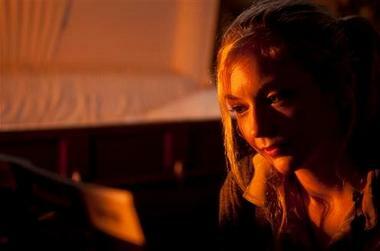 After eating, Beth goes into one of the viewing rooms and starts to play the piano and “sing. Daryl decides that an empty casket is a very good place to take a nap – “Comfiest bed I’ve had in years,”. After a little while, Daryl carries Beth back into the kitchen – not by piggyback, but more like over the threshold – and they hear a noise. Daryl goes to the front door and finds a dog outside. It runs away and Beth is upset that it wouldn’t come inside. They go back to the kitchen and Daryl tells Beth that he wants to stay a while at the house. If the people who live there come back, they could make it all work. Beth asks him why he’s changed his mind about believing that good people still exist. He doesn’t really answer her, just sort of looks at her, but she realizes that she got her answer in that look. He may be a man of few words, but Daryl seems to able to communicate what he can’t say. They’re moment is interrupted by another noise and Daryl goes to the door again, thinking the dog is back. It’s not the dog, but a mob of walkers. He tells Beth to run while he fends the walkers off alone. He gets cornered in the embalming room, but manages to make his way back up the stairs. He runs outside, looking for Beth and sees a hearse racing away from the house. He runs after it, screaming Beth’s name. The next morning, Daryl is still running down the road, following the tracks of the hearse. He stops, exhausted and sits on the ground. Within a moment, he’s surrounded by a group of men and he aims his crossbow at the head of the leader of the group. The man is much more interested in the fact that Daryl’s a bowman and seems to be quite knowledgeable about the crossbow, leading us to believe that these guys are hunters. He tells Daryl that if he’s shot, the rest of the men will kill Daryl before he has time to blink. He introduces himself as Joe and Daryl says “Daryl”. With that Daryl isn’t alone. The lesson learned by our dear survivors was that being alone isn’t going to work. There’s safety in numbers, even if the numbers are a group of total strangers. Now, who is/are the nut-job(s) that kidnapped Beth? Note: The opening song while Bob was alone was “Blackbird Song” by Lee Dewyze. Just perfect. This entry was posted in Walking Dead and tagged Beth, Carl, Carol, Daryl, Dr. Eugene Porter, Glenn, Maggie, Michonne, Rick, Sergeant Abraham Ford, The Walking Dead, Tyreese. Bookmark the permalink. My darling empress…I have been looking for that song all night!! Thank you! I am enjoying this season so much more…I think the prison depressed me. It’s all about me. I get to see varied scenery, they are “meeting” new folks, it’s just better. Then the whole idea of the different stories happening simultaneously. I like that. Thanks again for the song!! Lainey, TWD rarely has music, so I had to find out what the song was. I follow a couple of sites that have all sorts of TWD trivia and the song was on one of them. BB, fans are on twitter complaining that these past few episodes have been boring. I like the break from the relentless walker attacks as well as the back stories of the characters. Daryl is even more interesting and likeable now that we know more about him. Hi BB, you need to catch up!!! Last night’s episode really emphasized the loneliness for the survivors of the zombie apocalypse. Bob’s reaction to meeting Daryl and Glenn speaks to that; the loneliness. I think the men that found Daryl are the same men that took over the house where Rick was sleeping. Bad news! In the previews for next week, did it appear to anyone else that Lizzie was playing with a walker? What’s next with that girl? embee, I wondered about the group of intruders and this group of hunters. I did a little web searching and found that the guy who Rick almost shot on the front porch is none other than Joe. Lizzie scares me almost as much as the walkers do. It sure looked like her in the previews, playing tag with a walker. empress – thank you for finding that information about the hunters. I’m worried about Daryl too. He is definitely my favorite.character on the show. I wondered the same about the guys who found Daryl, embee. Now I’m worried about Daryl. Oh and Beth, WTH??? ?